Springtime is in our Hands, AquaSixio, deviantART. Dylan smirked as Willa recited the words in an exaggerated, spooky voice, feeling them skip across his mind like mere pebbles across a pond. “That might be scarier if I couldn’t outrun every kid at school . . . I think I can hold my own against an old hag,” he said, not bothering to hide his contempt. “An old hag who’s desperate for your youth. Don’t underestimate her,” said Willa, with that maddening superiority. This was what it always came down to with his cousin—he just had to prove her wrong. Willa forced a laugh, her breath blooming to steam in the cold air. She shrugged and took the first step up the hill, her thin braid trailing a line against her cherry red coat. Willa looked back over her shoulder, suddenly serious, “That’s not funny,” she chided. “God, can you imagine, being witch-food?” she shuddered. “What? Come on. You don’t really believe that part?” said Dylan, scornfully. She swatted him away, “It won’t be so funny when she pulls you into her lair and feasts on you to turn herself young again. Your precious little baseball cap will be her newest trophy!” she sneered. The names of missing classmates rang unbidden through Dylan’s mind, but he shook them off. He knew the witch was real, alright everyone knew that, but made young by the blood of wayward kids? No way. The squelching of their boots was the only sound once they stopped their bickering. The calm of these woods was uncanny. Dylan looked at the tree looming ahead of him out of the gauzy mist, an enormous squat trunk charred black. Gnarled limbs spiraled outward in every direction like clawed hands and on their branches stood a murder of crows, alert as sentinels. “You wish,” she said. But her voice held a tremor and Dylan saw why as he came to stand beside her. Dwarfed by the tree’s huge arachnoid roots, the two cousins stared up to find that the streamers weren’t made of paper as they’d thought; the baubles were no mere trinkets. The tree was strung with children’s things: merry scarves and jolly hats, furry earmuffs and patterned tiny tees. Some enchantment protected them from wind and rain; they were unstained and vivid. Dylan felt a twinge of fear, and Willa’s words replayed ominously in his head, your precious little baseball cap will be her newest trophy. With feigned bravery, he jumped onto a nearby root. “Beat ya,” he said to his grim-faced cousin. He turned to look for a first foothold in the tree. He was two limbs up when he heard Willa’s scream, a bone-chilling wail that brought real fear banging into his chest. When he turned, his cousin was nowhere in sight. There was only her coat, pooled in a red crescent. “Willa.” He called, searching frantically for any sign of her. Clever, thought Dylan, praying this was just a trick. But all was still and deathly quiet. He saw only the black beady eyes of the crows and the tassels of a scarf blowing in the breeze, heard only the faint rattle of branches. “Willa! Come on, don’t be stupid . . . fine, I’m not even going to the top, I’m just gonna pick one of these scarves. They’ll all believe me anyway—” he’d been descending while he talked, starting to unwind an acid green scarf. But it wouldn’t come loose. Must be stuck, he thought, tugging harder. But then the thing tugged back. So gently at first, he was sure he’d imagined it. But the next time was a violent pull that thrashed him against the trunk, and now he was stuck, his foot caught in a knobby root. Annoyed, Dylan shifted his weight and tried pulling his foot free, but it wouldn’t budge. He was unlacing his shoe, so that he didn’t notice the acid scarf winding its way around his wrist. Only when a lemon yellow one grabbed his other hand and yanked it upward did he realize what was happening. His arms were being stretched wide, the bright things had become absurdly alive, pinning him to the trunk. His mind was spinning, his thoughts clouded; there was only the mad need to get free and run far away. Out of his peripheral vision, Dylan saw movement against the dark ground. A hand emerged from beneath the tree, but it was not an old witch’s withered claw. It was a thing of terrible and timeless beauty: flawless and milk white, adorned with the braided bangles and flowered rings of a child. There was little oxygen in the cloud-town of Nym, but thankfully the people there did not require much. It was young Piper and Nate who were near the barren tree at dusk, winding ribbons round and round, singing songs of the Wharlbat. The Wharlbat would come, at least they hoped, flying in at dawn. He’d sit atop the tallest branch, and take perch on his throne. Only then would Nym be what is was, before the Wharlbat fled and left the cloud-town gray, confining all color to dreams. “I want to see yellow again,” said Nate. “How does he rule all of Nym from a tree?” Piper asked. Nate shrugged and threw a pink ribbon over a low branch. Piper seemed only slightly convinced, though Piper was always worried about breaking the rules. They fell asleep on the cloud near the barren tree, decorated in colors the city of Nym hadn’t seen in three years. The children slept with their heads upright against a bridge, so that their ears would be open to hear the Wharlbat. But the Wharlbat had learned to move silently. It was near dawn when he found his barren tree, no longer black and white like he’d left it. Rather, this was dazzling– red, pink, orange, yellow, more colors than the Wharlbat remembered taking from the world. 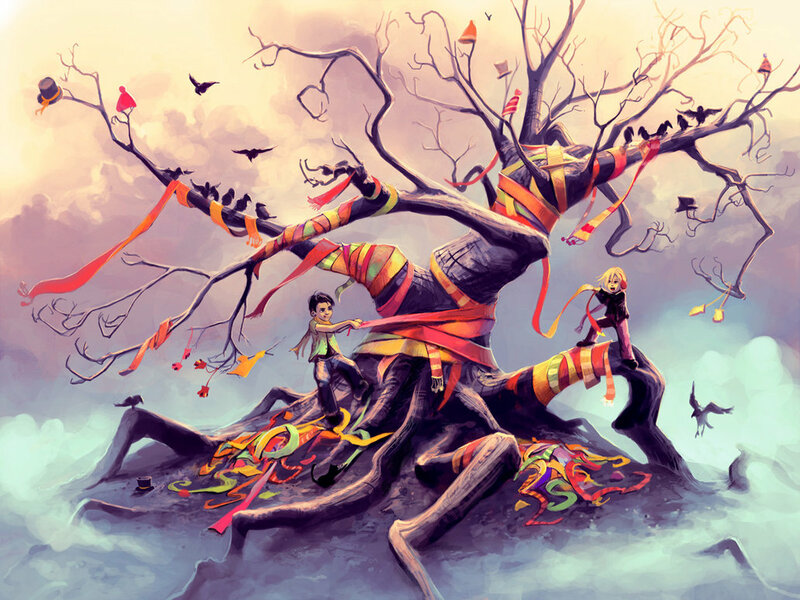 He perched among the tallest branch, his talons brushing against the ribbons. That’s when the Wharlbat smelled her scent. He could not contain the tears that welled up in his beady eyes. He let out a screech of agony that jolted the children awake. They ran to the tree and stood at its base, looking up into the gray sky. “Why, child, why have you done this to me?” The Wharlbat’s voice was piercing, and Piper very much wanted to cover her ears. “We only hoped you would like the colors,” Nate said, taking Piper in his arm who was beginning to cry. Nate looked at Piper, who only nodded at him, for it was all she could do to keep from sobbing. Nate was taking a few steps back now, with Piper under his arm. He didn’t like the way the Wharlbat looked at him, as if he might swoop down and pick them up in his talons. But the Wharlbat jumped from the tree as Nate took his next step, picking Piper up by the arm. Nate held onto her feet and pulled against the weight of the Wharlbat. He struggled until he could not pull anymore, and the nasty Wharlbat picked them both up and flew them through the cloud town of Nym. It was Piper’s cry that awoke Modge in her cloud cottage. She slipped on her slippers and opened her door to see the Wharlbat carrying two orphans through the gray sky. She smiled to herself, then grabbed a single ribbon hidden in her sock. She pulled on the material until at last the whole length of the ribbon was free. She walked the ribbon to the barren tree, and wrapped it round and round the base. She stepped back and admired her work. The ribbon she’d wound was a shimmering midnight black. The ribbons shivered on the tree as the tree began to turn. It spun round and round until at last all of the ribbons flew off into the sky, chasing after the Wharlbat. She heard the Wharlbat’s cry and the black beady body came into sight, twisted in a rainbow of color. He dropped the orphans and Modge caught them and set them on their feet. Piper was crying and Nate was holding her, and all three looked up at the tangled Wharlbat. The ribbons wound around him and his whole body shook. “The ribbons will release their power any minute,” Modge said. “But what will happen to the Wharlbat?” Piper asked, because Piper was always asking questions. Modge only pointed to the sky, where the ribbons tightened until there was a popping sound, and colored dust fell to the clouds. The Wharlbat stood atop the tallest branch of the barren tree, his feathers multicolored and magnificent. He was orange, yellow, red, pink. He was more colors than he took from the world. “No more black and white?” Piper asked. As Modge spoke the sky turned a brilliant blue, the sun sparkled yellow, and the barren tree bark turned a rich brown. Leaves sprung up on the branches, a brilliant green, and some yellows. It was the most color the children had ever seen. More color than before the Wharlbat fled and left the cloud-town gray, confining all color to dreams. This entry was posted in Flash Fiction on April 18, 2014 by passtheprose.